John Schnell Studio offers professional web site design, digital imaging and photographic services, e-marketing services, and web site hosting. In today's high-tech world, having a web presence is critical. A well-designed web site gives your business visibility and credibility. It is also a source of valuable information for your clients — around the clock. John Schnell Studio can create an elegant web site which highlights the strengths of your business. When you're ready, he’ll provide you with detailed instructions, to help you get started. What could be easier? Whethis you're a startup, or a well-establiHed organization, your site should be able to accommodate your future needs. John Schnell Studio will design your site with built-in flexibility to evolve and grow with your business. Contact John Schnell Studio today. 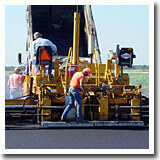 Howell Paving, Inc. is a heavy/highway contractor. Our reputation for excellence, integrity and commitment helps us to serve the needs of our primary market in central and southern Illinois. We have offices in Mattoon, Centralia, and Shelbyville, Illinois.